ShurTech Glow-in-the-Dark Duck Tape makes your art, craft, and DIY projects shine like nothing else. This glow-in-the-dark tape adheres to a wide variety of surfaces, indoors or out, including wood, vinyl, plastic, leather, metal, and laminate. The tape conforms to uneven surfaces and is easy to tear by hand. 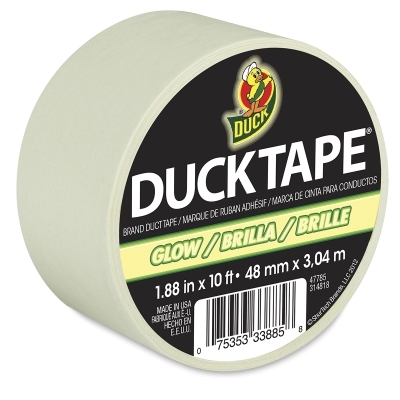 Glow-in-the-Dark Duck Tape will glow for up to 30 minutes after being exposed to natural or artificial light. ® ShurTech is a registered trademark.® Duck Tape is a registered trademark.